Updated about 3 yrs, 11 days ago (April 8, 2016). Know a better answer? Let me know! I sometimes want to edit a file in Windows, but not change the modification date of it. After a quick search, I found this simple free tool which lets me do just that. Download and install Stefan’s Tools SKTimeStamp. 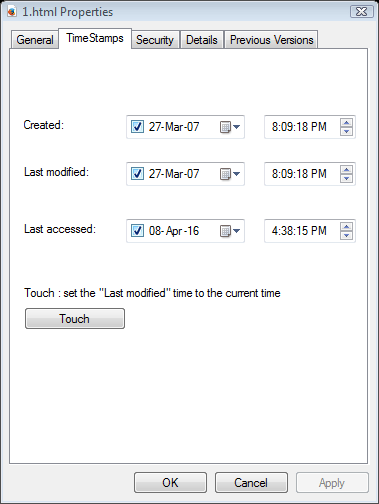 This will add a TimeStamps tab to the Windows Properties dialog. Right click (or ALT+ENTER) on the file you want to edit without changing its modification date. This will open its Properties dialog. Go to the newly added TimeStamps tab. Leave this Properties dialog open. Edit the file as you would normally. Once you have finished editing the file (and saved it etc.) go back to the Properties dialog you left open in step 4. Change one of the times up and down one second (or any other similar change) to enable the Apply button. Your file now has the created and last modified dates that were specified in the Properties dialog, which as you hadn’t changed them since before you edited the file, are the same as before you edited it. Attribute Changer can modify system attributes and manipulate date and time of files and folders. It has filters and does offset calculations on the date. BulkFileChanger is a small utility that allows you to create files list from multiple folders, and then make some action on them - Modify their created/modified/accessed time, change their file attribute (Read Only, Hidden, System), run an executable with these files as parameter, and copy/cut paste into Explorer. Windows Taskbar Refuses To Auto-hideHow to fix when the Windows Taskbar refuses to auto-hide.Reset The Desktop Windows Manager In WindowsHow to reset the Desktop Windows Manager in Windows.Fixing Error 720 On An SsTP VPNFixing Error 720 on a Server 2008/2008 R2 Secure Socket Tunnelling Protocol (SSTP) VPN.Map Keystrokes Ctrl + Tab And Ctrl + Shift + Tab To Microsoft Intellimouse ButtonsEver wanted to map a mouse button to a character you can’t enter into the Intellimouse/Intellipoint control panel, such as the Tab key? Here’s how.Enabling Digital Audio S/PDIF Pass –Through Via HDMI On DisplayPortHow to send digital S/PDIF surround sound to an HDMI device via the DisplayPort on a Dell Latitude E6500..How To Fix Windows 7 Bug Where “thumbs.db” Prevents Renaming Or Deleting Most Recently Viewed FolderYou receive an error “The action can’t be completed because the folder or a file in it is open in another program. Close the file or folder and try again” and it mentions Thumbs.db.Remove Folders From Media Center’s Media LibraryHow to remove folders from Media Center’s Media Library, including those that you can’t normally.How NOT To Redirect OWA On Exchange 2010How to simplify the Exchange 2010 OWA address without causing all sorts of problems.Remove “My Sharing Folders” From My ComputerHow to remove the My Sharing Folders icon from My Computer in Windows Vista, XP.Remove Advertising From Windows Live Messenger Or MSN MessengerHow to customise and remove the advertising and other annoying features from Windows Live Messenger and MSN Messenger. Works for Yahoo Messenger too.Negative Delta Time Error In Dual-core Based SystemsExperiencing the error “Negative delta time!” when playing Unreal Tournament or a game based on its engine, on a dual-core processor, and/or under Windows XP/Vista?Exchange Management Console Permissions GoneHow to correct error “you don't have sufficient permissions to view this data” from the Exchange Management Console Organisation ConfigurationWindows Media Centre Remote Control & WinampHow do I make my Windows Media Centre remote control work with Winamp?Correcting Clock Drift On A CentOS VM Under Hyper-V On Server 2008 R2How to correct clock drift on a CentOS 5 virtual machine guest running on a Server 2008 R2 Hyper-V host.Enable EPG TV Guide In Media CenterHow to enable the Electronic Program Guide for TV broadcasts in Vista or XP Media Center for use in Australia.How To Activate An XP Mode VM On Windows 10You are running Windows 10 and you want keep using an XP Mode virtual machine after its activation has expiredEnable S3 Suspend For Media CenterHow to enable S3 Suspend for Media Center, to allow a remote control to place the media center computer into an S3 (STR, suspend-to-RAM) state, and unsuspend from that state.Template-Based SiteMake a simple PHP-based template-drive siteBypass PHP Output Buffering When Using Apache Mod_deflateHow to output content immediately to the browser by bypassing PHP’s output buffering using flush() & ob_flush() while still using Apache mod_deflate to compress page contents.How To Fix Windows Live Messenger For Mobile ProblemsHow to fix Windows Live Messenger for Mobile problems.